LASTS ALL YEAR. GUARANTEED! * High-quality paper resists ink bleed** 5 subjects; 200 college ruled sheets. Patented, reinforced storage pockets. *** 4 dividers, each with 2 pockets; water-resistant plastic cover; Spiral Lock wire. Neat Sheet perforated pages of 11" x 8 1/2” easily tear out. Made in the U.S.A. Overall size: 11" x 10”". 6 Pack. *ACCO Brands will replace any Five Star notebook that is returned within one year from the date of purchase. This guarantee does not cover damage due to misuse or abuse. Contact ACCO Brands Consumer Affairs for instructions. ** Ideal for notetaking and homework, you can write on both sides of the paper and notes will stay clear and legible. **Under normal usage, paper resists ink bleed with common student writing instruments such as pencils, ball point pens, gel pens, felt tip pens and highlighters. ***Based on independent laboratory test results that establish pocket tear strength as compared to non-reinforced pockets in Five Star notebook. 4 dividers, each with 2 pockets, store letter size notes and hand-outs. Water-resistant plastic front cover and heavy duty paper board back cover protect your notes. Spiral Lock wire prevents coil snags so it won't get caught on your clothes or backpack. The Neat Sheet perforated pages easily tear out with clean edges. Made in the U.S.A.
Perforated sheets measure 11" x 8 1/2" when torn out. Overall size of 11" x 10". 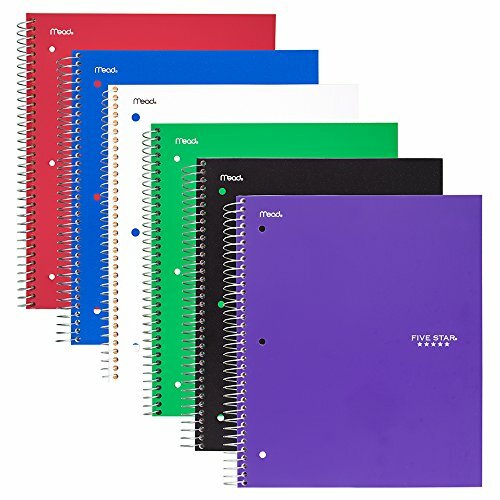 Pack includes 6 notebooks: Black, Red, Cobalt Blue, Electric Green, Royal Purple and White.